Two Uses Tuesday is LIVE until Friday at 11pm EST (3am Saturday UTC). Great lighting is so important to take that image from so-so to WoW!. Natural light is the easiest cheapest way to achieve that but sometimes you might have to wait to capture those golden hour moments. If you need to fake it a few light bulbs and a white poster board (to bounce light off) will give you the next best thing! Not sure how to link up? Click here to learn how. Most loved and most mouthwatering! Stacie found the way to our hearts through our stomachs with her Meatzza Casserole. Kaitlyn whips up a DIY terrarium with just four supplies and steps. Plain pots and shelf liner are all you need for your own DIY cachepot. I love the wood grain TwoPlusCute uses. Makes the plant and pot blend nicely. Perfect quick and easy dinner, or lunch, try Sam's Mediterranean quinoa salad. Nothing says Easter like a fluffy bunny bum bunting. Stop by Jenn's place for the free template. Lindi dazzles us again with her DIY projects. Check out her Industrial Pendant light and get the free plans to make one yourself! 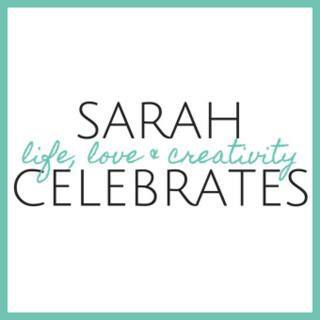 Follow Sarah Jaskowski @ Sarah Celebrates's board Two Uses Tuesday FEATURES! on Pinterest. 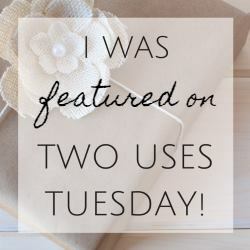 Remember, share & pin the Two Uses Tuesday Features from the bloggers original content or straight from the 2usesTuesday features pinterest board. Congrats to this week's featured bloggers! 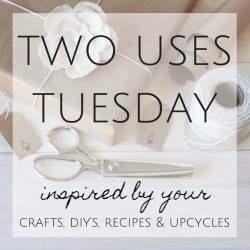 I was featured on #2usesTuesday ! Thank you for inspiring us to create! Don't forget to brag about it =) Grab a button, tweet it to the world and watch for it on the Two Uses Tuesday FEATURES! board on Pinterest. Grab the party button for your blog's party page, linked posts or sidebar! 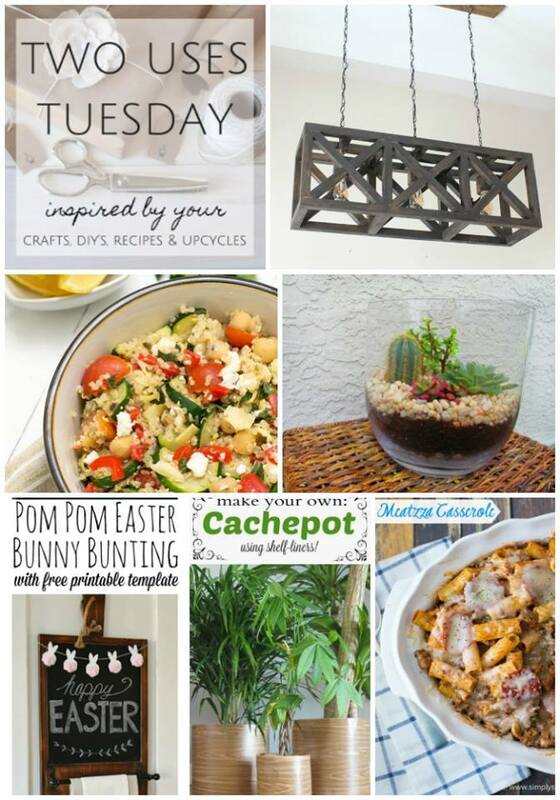 BE CREATIVE & LINK UP - Share up to three (3) up-cycling, re-purposing, DIYs, recipes and craft projects. Original work and posts you haven't submitted previously please. COMMENT & CONNECT - Visit two (2) links for every post you submit and show a little comment love. I just linked up at #2usesTuesday. Come and join me! Disclosures: By submitting a link to the Two Uses Tuesday Link Up you are giving the party hosts permission to feature your link on our blogs, across social media and future round up posts. 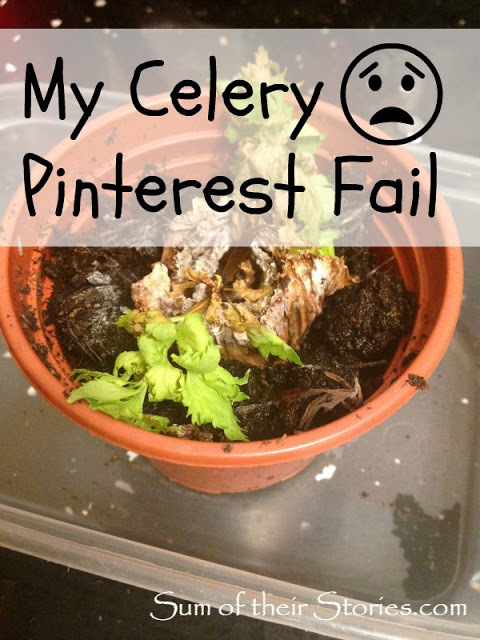 This includes images from the linked post as well as linking to your social media accounts. Sarah Celebrates and all Two Uses Tuesday co-hosts respect you and your work; everything will be properly linked back to you and credit given where credit is due. You earned it! And if you visit at the start or end of each party you can catch both parties live at the same time! 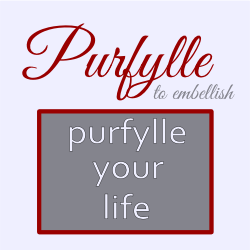 Link your post at #2usesTuesday and link your Pinterest Pin at #Pinbellish. as always a yummy and creative party!! Wow! SO many talented bloggers! Glad I got to come out and play today! !